I tried to get some pictures last weekend, but they didn't turn out for some reason (apparently it's best if pictures are in focus – who knew?). But conditions looked promising on Tuesday night – cold and rainy – the perfect weather for standing outside with a camera. Actually, the rain and drizzle that night looked kinda neat. 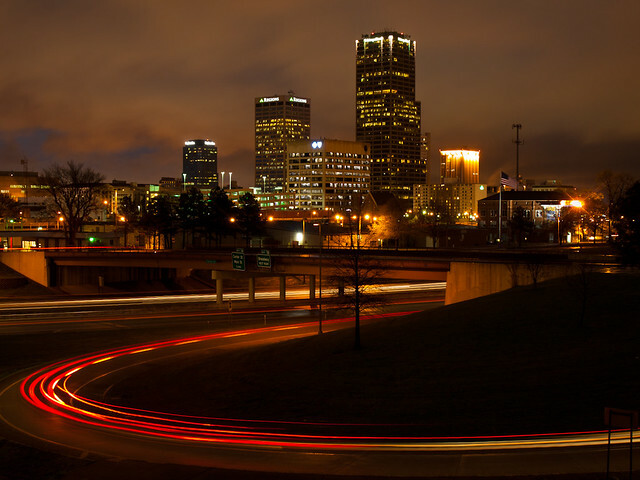 There was a bit of a low fog, so I grabbed the camera after work and headed towards downtown Little Rock. The original plan was to get a shot of the fog obscuring the tops of the buildings downtown. So I ended up heading to a spot overlooking I-630, which provided a decent view of the skyline and the freeway. I had hoped that the rain would have blown through by the time the light was good for pictures. But of course, it was raining even harder at dusk. I got out the umbrella, feebly wrapped the camera in a plastic grocery sack, and attempted to get a good picture. The rain switched from being a light rain to a fine mist. Whichever it was, it did a spectacular job of floating up under the umbrella and sticking right on the camera's lens. At the same time, the wind would kick up and attempt to tug the umbrella out from my hand. Fun times were had. I ended up finding an old lens hood in my camera bag, which actually was for a lens I don't own anymore, and jammed it awkwardly on the front of the lens. The hood was long enough that, I hoped, it would help prevent some of the rain from getting onto the camera. It sort of worked, in that there was less water to wipe off the lens every few minutes. Last weekend, I made a pilgrimage to my holy land of sports – Frisco, Texas. There in the suburbs of Dallas, you will find a cathedral of soccer, the great Pizza Hut Park. At the alter of soccer I made a sacrifice, which was a few hundred miles on the car, many gallons of gas, a hotel room, and the game ticket (although thanks to Groupon we had a good deal on the tickets – half off!). 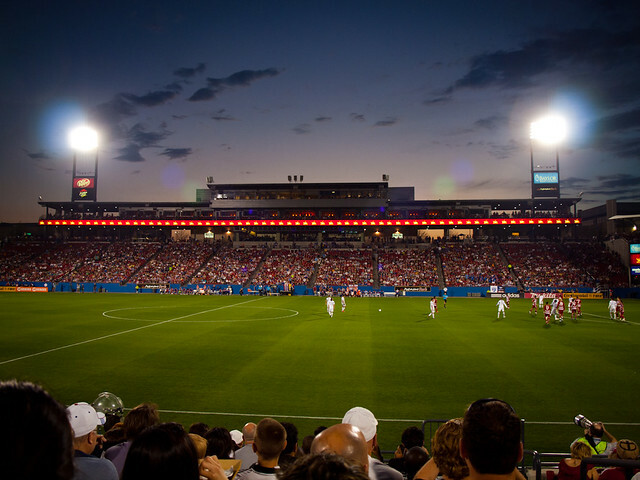 On the verdant grass of the pitch, I went to see my saints of soccer play, the legendary FC Dallas. The great crusaders nearly made it to the heaven of Major League Soccer last season, playing in the MLS Cup Final. Their loss to the vile Colorado Rapids still leaves a bad sting. But the new season brings hope that they will again return to the promised land, and finally bring home the MLS Cup trophy. 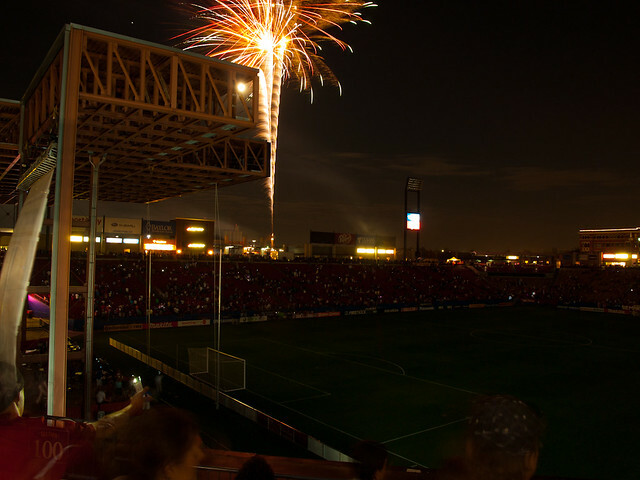 The season opener saw my beloved FC Dallas playing against a rival, the Chicago Fire. The dastardly Chicago team would manage to score the first goal, in the 16th minute. 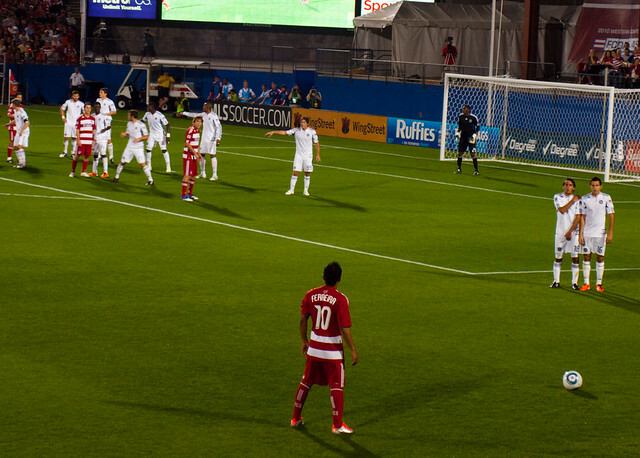 Luckily, the good guys would come back, as FC Dallas would score the tying goal a minute later. In the second half, a Dallas player ended up getting a red card, so the good guys played the rest of the game down a man. The next stop was to the Smith Creek Scenic Area, which is located on the south end of Boxley Valley. 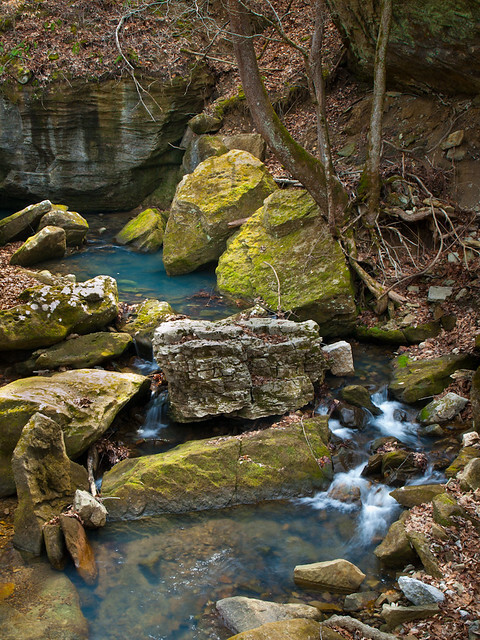 The Nature Conservancy has protected the creek (which flows into the Buffalo River) and the surrounding area. The small creek will sometimes disappear on its path, running through an underground cave system. 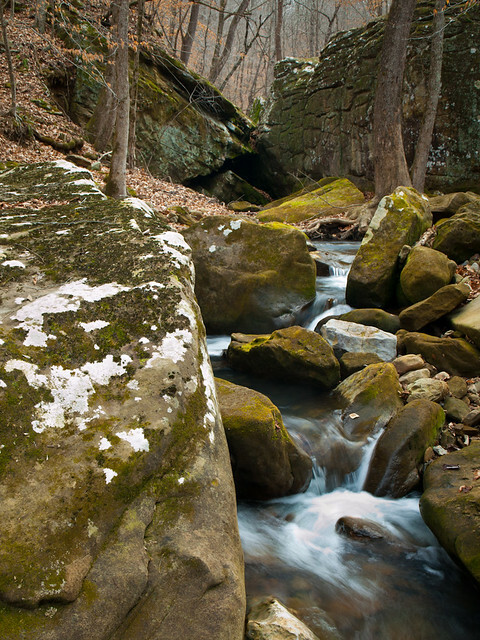 When it's above ground, the creek travels past and over huge boulders and several waterfalls. The light was tricky out there. The sun was out, so most of my time was spent standing by the camera waiting for a cloud to pass overhead. I can't believe I've never been to visit Sweden Creek Falls before. It's a cool 81 foot -tall waterfall that is pretty easy to reach. 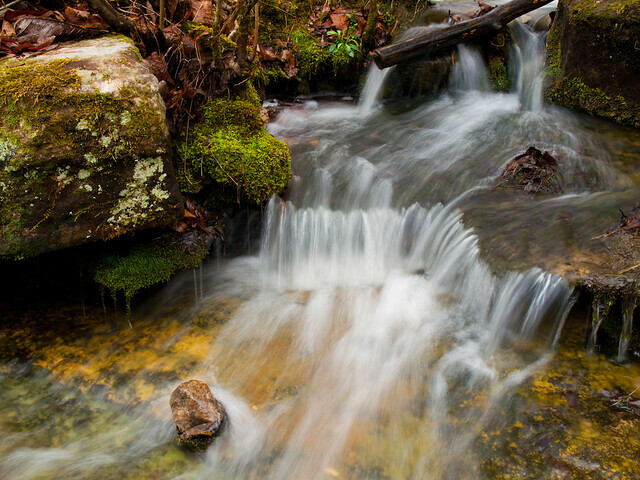 The hike in isn't bad, and it's just a few miles away from the Arkansas photographer's mecca: Boxley Valley. I woke up early on Sunday morning and met up with Matt in Conway, and we drove up north into the Ozarks. 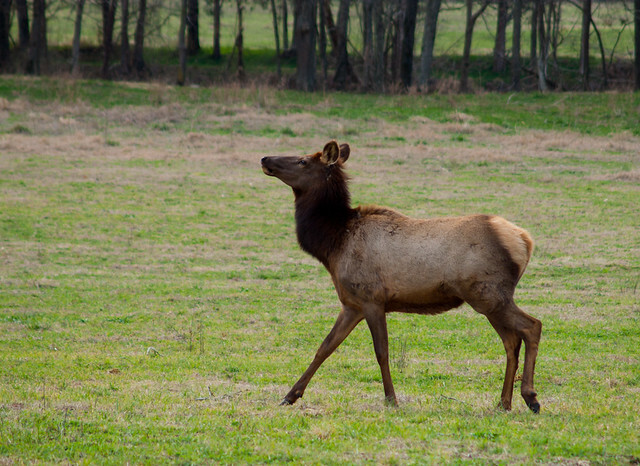 Eventually we made it into Boxley Valley, and even saw a few of the resident elk out and about. The elk were right by the road, which usually means that there would be a throng of elkarazzi out trying to get pictures. But the valley was unusually quiet, and we were the only ones snapping pictures of the elk. Then we drove up a few miles and turned onto a dirt road, which we headed down for a few miles. 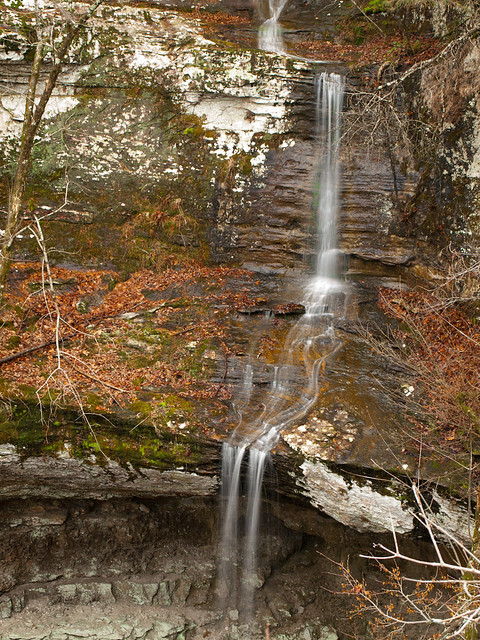 Sweden Creek Falls is a Natural Area that is protected by the Arkansas Natural Heritage Commission. From the dirt road it's a 1.8 mile hike down to the falls and back. The hike isn't that bad, but the way out is nearly all uphill. For the first half of the hike, the trail is an old road that runs down the hill and by an old house. Once you get past the house, the trail then follows alongside and under a bluff. Quickly you find yourself at the end of the valley, with the falls ahead of you. The weather was predicted to be cloudy that day, but I was disappointed to find it bright and sunny when we got to the falls. There was nary a cloud in sight. Luckily, the falls were still in the shade, so we were able to salvage a few pictures. We got a few more pictures, and vowed to return when the falls would have more water in the Spring. 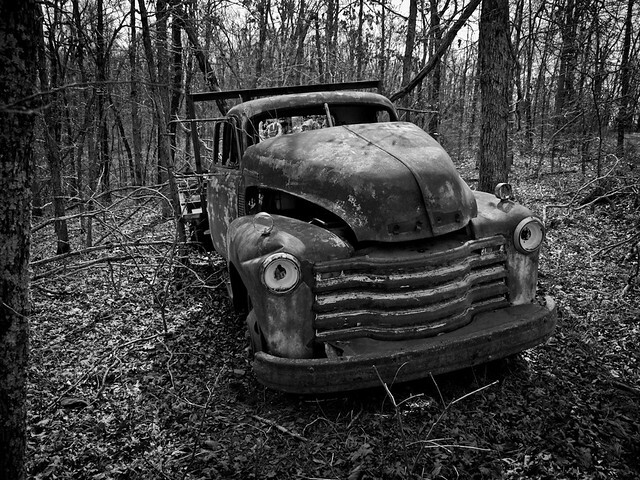 Actually I'd gotten a shot of this truck before, way back in 2007. 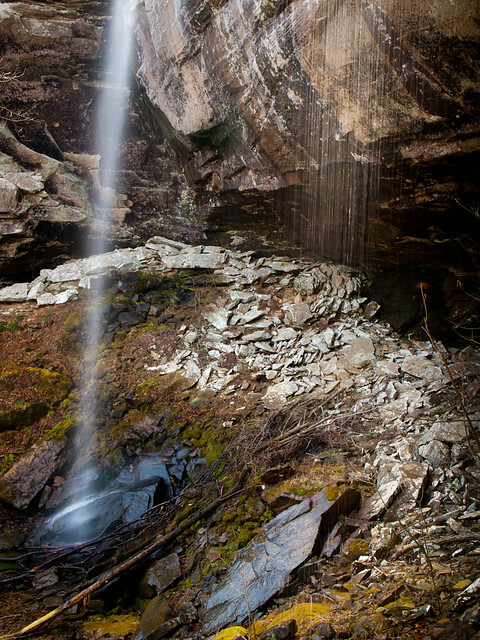 Our next and final stop on this tour around the Leatherwood Wilderness is Three Springs Falls and Cascade. As the name says, the waterfall is fed by water from three springs. 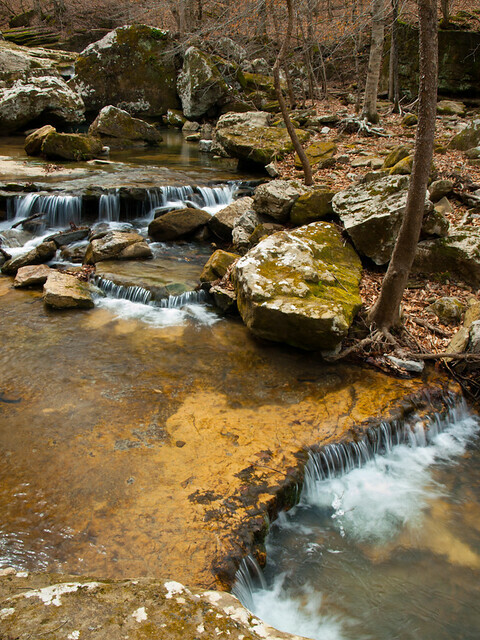 The springs join together, then flow over a 14 foot-tall cascade, then swing through a mossy creek bed, and then drop over a 45 foot-tall waterfall. It's a neat place, and very easy to visit. 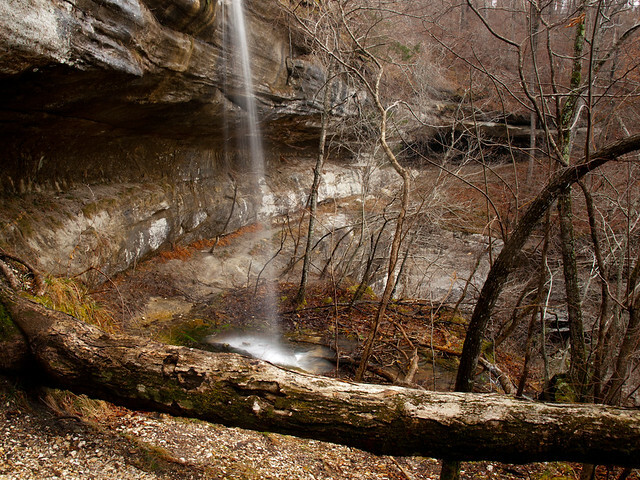 The falls are actually just a short half-mile drive from Bumpers and Dewey Canyon Falls. The trail to the falls is short (.3 miles to the falls) and an easy hike. There is some lingering debris from the 2009 ice storm here, and the worst of it seems to be around the top of the falls and the creek. 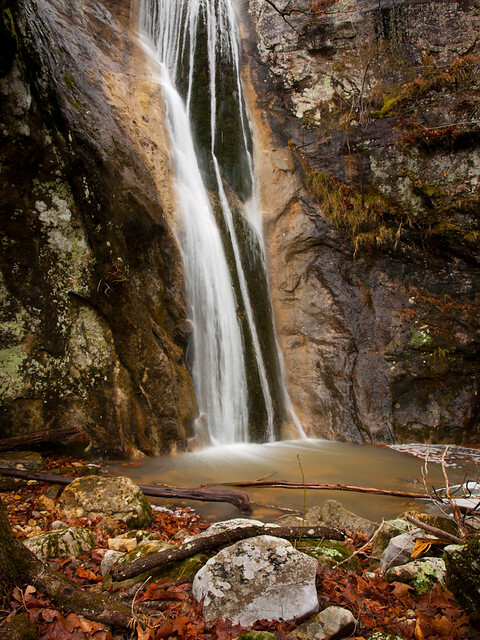 There is another waterfall there, located along the same bluffline as the Three Springs Falls. 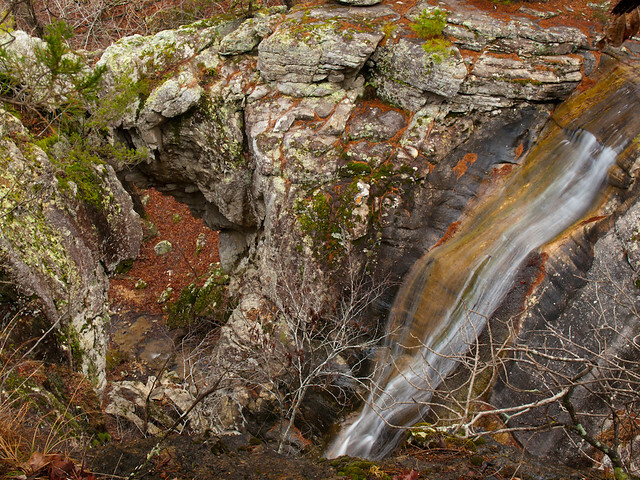 This other waterfall is where a small creek has carved its way through the limestone on top of the bluff, eventually making a 23 foot-tall waterfall. This waterfall isn't named in the Tim Ernst guidebook, and I didn't see any names (or pictures of it, for that matter) online. The falls need a name, so it shall henceforth be referred to as Ferreira Falls. Similar to Cunningham Falls near Falling Water Creek, I decided to name these falls in honor of a player from my beloved FC Dallas. So this fall is named after David Ferreira, who was chosen as the most valuable player in Major League Soccer last season. I'm looking forward to seeing him lead the team to another chance at MLS Cup this year (season opener is Saturday!). This is another part of Ferreira Falls, where the creek has cut a deep channel through the rocks. From here, the creek curves around and drops over the bluff. After that we tried to visit two other nearby waterfalls - Blow Cave Falls and Rory Ridge Falls. 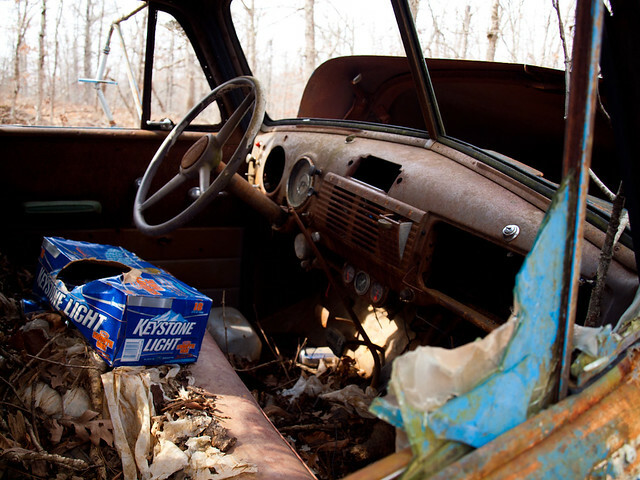 They are located nearby in the Ozark National Forest, however, it looks like the land around it is private property now. 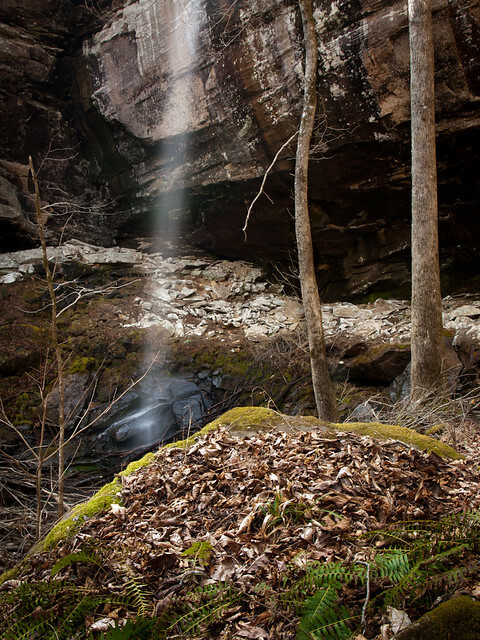 Our tour of the waterfalls of the Leatherwood Wilderness continues, with a visit to Dewey Canyon Falls and Dale Bumpers Falls. These two falls are both quite tall, and also amazingly easy to visit. Although you can't see them from the road, they are reached via a short and easy hike. You get there from parking along Hwy. 341, about 9 miles or so north of Big Flat. You just have to park along the side of the road, and walk just .02 miles to the falls. There is a trail that starts out next to the guardrail alongside the road. 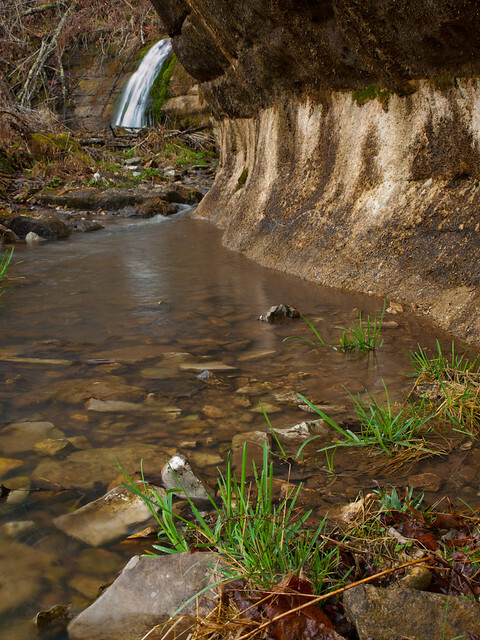 You follow this trail down a hill, meeting up with the creek that makes Dewey Canyon Falls. 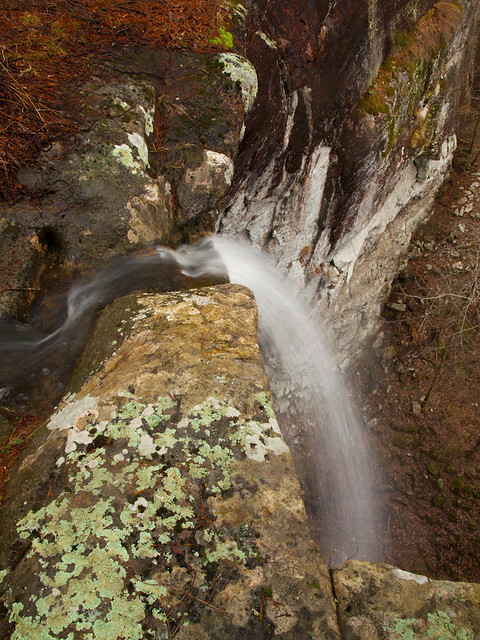 The trail and creek both run up to the side of the bluff, providing you with views of the 88 foot tall waterfall. Dale Bumpers Falls is just a short stroll away along the same bluff line. 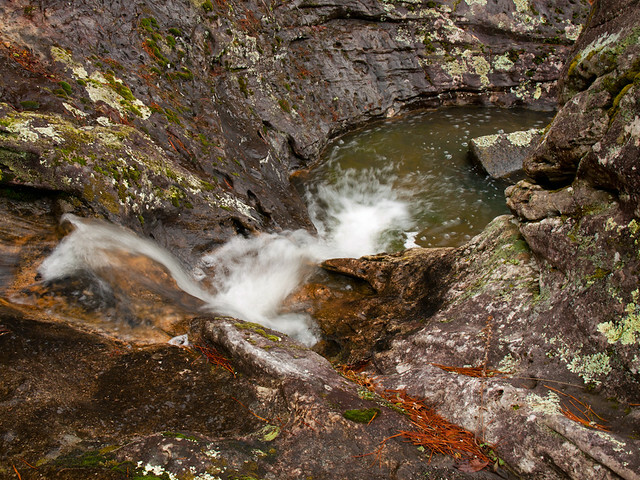 This is a shot with both Dewey Canyon Falls and Bumpers Falls. Bumpers Falls is the one closest to the foreground, which is split into two waterfalls. 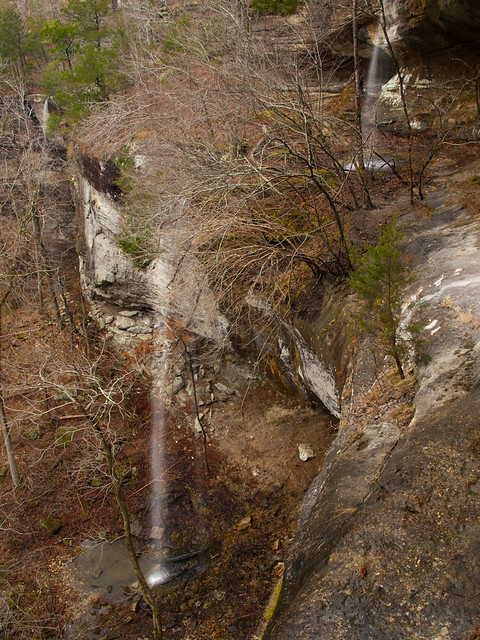 The falls first drops down 27 feet, and then tumble over the bluff into another 71 foot tall waterfall. The 88 foot tall Dewey Canyon Falls is in the background. 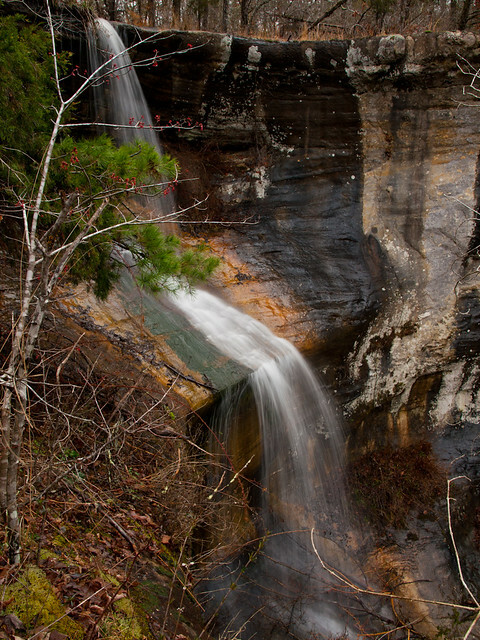 This is a shot of the lower Bumpers Falls, which were named after former governor and senator Dale Bumpers. Since a good number of my family is from Charleston, I feel obligated to mention that Dale Bumpers is a proud native of Charleston, Arkansas. This is a view of the upper Bumper Falls. The damage from the 2009 ice storm wasn't all that bad in this particular area, but I assume this fallen tree was a casualty of the storm. After hiking back over to Dewey Canyon Falls, I set up the camera just at the top of the falls. The winds were a bit heavy that day, and would occasionally send up spray from the falls over me and the camera. This was the only shot I got from that spot that didn't have water on the lens. 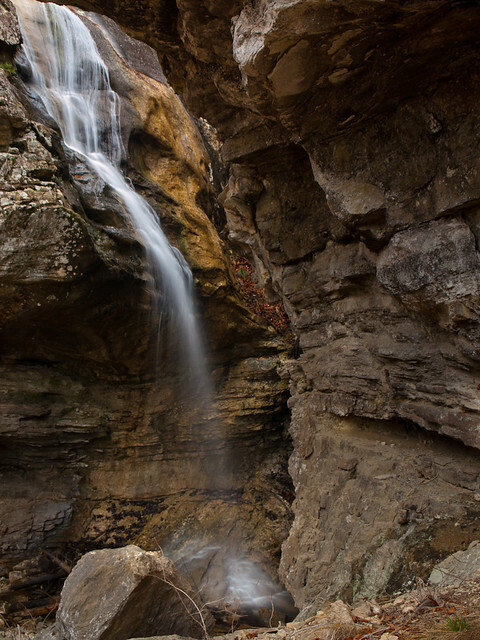 Just a few miles away from Funnel Falls, you will find several other waterfalls all located near the road. One of those is the 77 foot-tall Cougar Falls. And a closer view of the falls. Contrary to the fall's name, we didn't see any cougars out there (be it feline or of the frisky older lady variety). 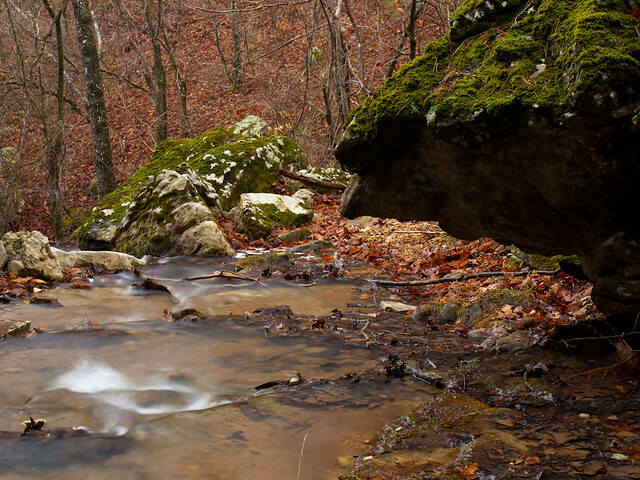 The Leatherwood Wilderness is a remote and scenic part of the Ozark National Forest. The wilderness contains over 16,000 acres of woods and streams, including dozens of waterfalls (many of them over 80 feet tall). 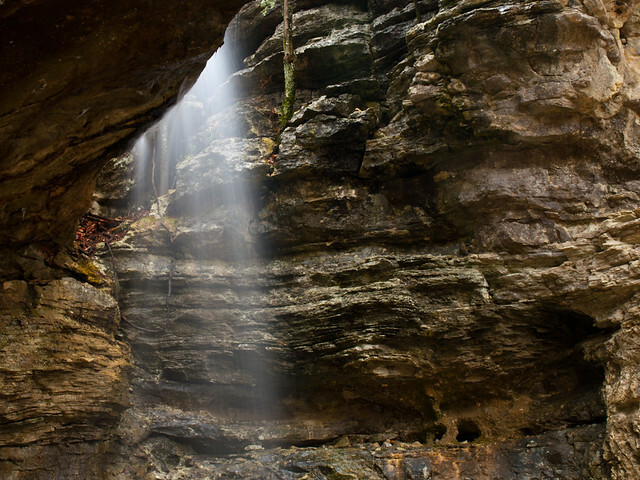 It doesn’t seem like very many people venture out there, even if popular recreation spots like Blanchard Springs and Gunner Pool are located nearby. 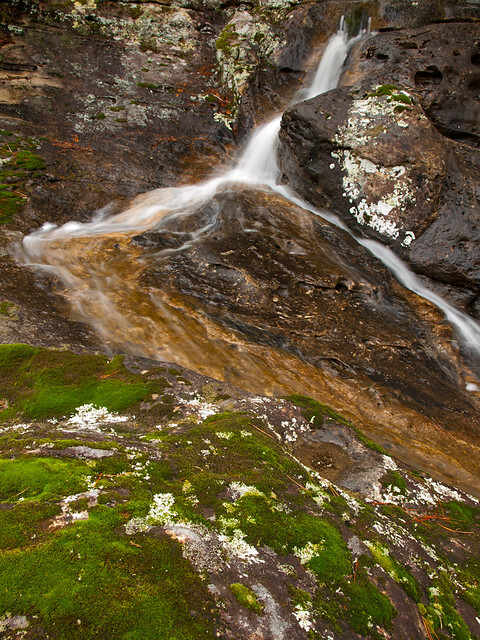 One of the more interesting waterfalls in the wilderness is called Funnel Falls. It’s a spot where two waterfalls tumble over a bluff, with one of the falls rushing through a funnel by a natural bridge. 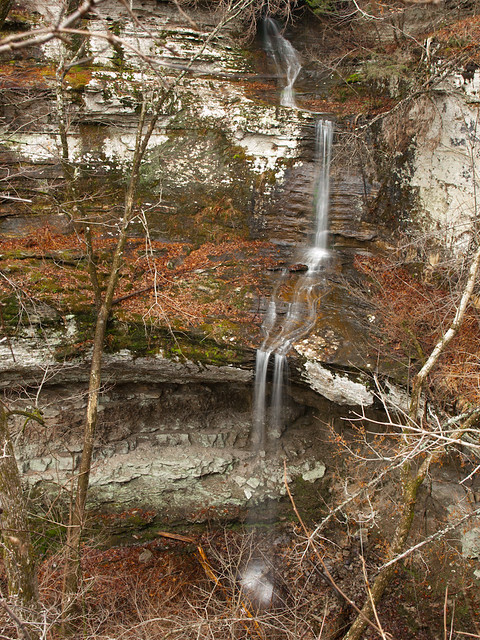 The falls can be reached by hiking about a half-mile from the road. Be sure to find the trail that leads down there, otherwise you’re stuck trying to bushwhack down a hillside that is covered in ice-storm debris. A big storm passed over the state last Friday night, dumping some much-needed rain. The rain was enough to force me to be awake early, where I found myself standing in the chilly morning air just after sunrise at the road through the Leatherwood Wilderness. I headed up there with Matt and Zack, and we set off through the woods towards the falls. This is the East Funnel Falls, which are a good 50 feet feet tall. And a side view of the falls - the creek here twists around and is funneled down by the natural rock formations, hence the name. 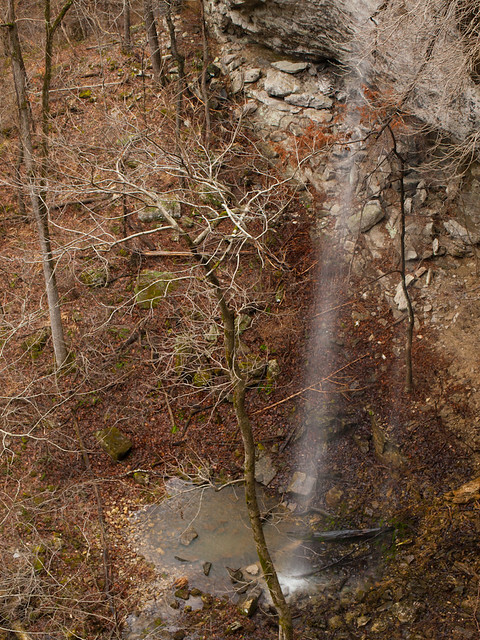 I headed over and got a few pictures of the West Funnel Falls, which drops straight down sheer rock. The falls needed a bit more water in them, but the color in the rocks was neat. It almost looked tropical.